#27 SP REALIZATION IN TUE LAW WHITHER NOW? MIDYEAR MEETING OF THE LOUISIANA ""
#31 SPECIALIZATION IN THE LAW WHITHER NOW?. even among the conservatives, is to live and let live. student leader of that parade was Alexander Hamilton. process with a capital D and a capital P.
administrators have historically been pretty good at that. the past tended to be overly severe. accept the responsibilities that accompany those rights. pranks to be forgotten and forgiven. could be tested in the higher court against the higher law. risked apprehension, imprisonment and often death. grounds that they were done for conscience's sake. conscience to disrupt a civil rights rally? selves be the first victims of the lawlessness they advocate. call for violating the rights of other American citizens. the majority thereof, and it must be enforced. and the Revolution were bitterly opposed by many Americans. corded under the law to individuals and groups been stronger. is one thing an important and essential part of any democracy. nevertheless always faithful to the nation. the more extreme and outlandish claims of the bureaucrats. civics courses which made us glad and proud to be Americans. individuals of opportunities and rights. Of course our society does have shortcomings. where we are to the future world of their hopes and ideals. individual responsibility to others and to our country. to believe that it will do so again. can and should help the pendulum swing. State Bar, Buena Vista Hotel, Biloxi, Mississippi. Address: "Legal Specialization Pros and Cons"
Delivery: Thursday, June 27, 1968, 4:00 P.M.
zation continues to persist and expand. Board of Governors and the House of Delegates. ters were reflective, studious, and thought-provoking. be of inestimable help to us in reaching our final conclusions. those replies are now being carefully studied by our committee. at the 1969 Mid-year Meeting. have reached at this point in time of our overall effort. structural deficiency exists in the legal profession. it as to preserve our traditional ethical concepts. areas in which they are not individually competent. specialize are of course only self-proclaimed specialists. does nothing to insure the integrity of that self-proclamation. image attributable to the non-regulation of specialization. entitled to accreditation as experts. what may be a false claim of special proficiency. specialized layman rather than to a lawyer. by those limiting their activities. are now doing in legal areas outside of their own specialty. experience and particularized training and study. known to their prospective clients. their lawyers enable them to be specialists in every field. ultimate survival of the independent sole practitioner. arguments which have been presented to it. must still be a lawyer and not a mere legal technician. general public of their certification. activities of the organized bar is and has been monumental. medical profession limit the use of the analogy. provide against many practical problems which will develop. providing quality legal services in specialized areas. among lawyers debating the "HOW" of legal specialization. should be permitted to practice in specialized areas. is closely related to the question of initial certification. should not be excessively difficult. "Grandfather clauses"
experience in the branch to be certified as a legal specialty. tion would naturally become more difficult. the whole field of business law included as a specialty. specialization can be further defined. the states in both substantive and procedural law. and professional discipline are handled at the state level. and obvious ingredient of any acceptable plan. without waiting for action by the American Bar Association. system of certification of specialists would be obviated. admission of lawyers to the practice. of the problems which will inevitably arise can be obtained. is placed at the national level. and Practices for Regulating and Certifying Legal Specialists"
tained from the states in certifying and regulating specialists. adopted by the various states. can be devised will be available for consideration. citizen who needs specialized legal services. that the issue is not whether we will have specialization. The time to act is here and now. fession, nor for the American Bar Association. ization in the law practice has continued to expand. Florida, and I serve as Chairman of the Committee. and letters were reflective, studious, and thought-provoking. Committee will never agree to all that I say. restrictions on their own practice. protect the public who rely upon that implied sanction. public inevitably turning to specialized laymen for expertness. our traditional ethical concepts will not be impaired. brought disfavor on the legal profession as a whole. false claim of special proficiency. than to lawyers, will be minimized. experience and their continuing legal education. potential savings to their clients. a similar fractionalization of the legal profession. service to clients in areas which overlap several specialties. be obtained therefrom in the context of specific programs. which may be placed upon practice by a certified specialist. with additional exposure to liability for error and omissions. consider a uniform plan for use in all jurisdictions. is now regulated almost exclusively within the various states. is the only way in which this desirable reform will be achieved. District of Columbia is a state in the reference I here make. the problems involved, and possible solutions thereto. of lawyers to the practice. though he is certified in a particular field of law. and may not be attributed to or fulfilled by a law firm. certified as a specialist therein. proficiency as a specialist should be provided. problems which will develop in practice to be handled. branch to be certified as a legal specialty. As time goes on. the whole field of administrative law included as a specialty. the usefulness and effectiveness of general practicing lawyers. detriment of small firms and individually practicing lawyers. insure the ultimate survival of the independent sole practitioner. Admittedly, many of my statements are argumentative. of law will be regulated or unregulated. but at the same time, it has created certain multiple problems. have the benefit of the experience thus obtained. which require specialized technical non-legal training. requiring a knowledge of a foreign language. in such program or system. handling of the legal work of his particular clients. discussions, before I finally conclude my work. "Specialization in the Law Whither Now?" to final approval by the House of Delegates. meeting of the committee wi e held Saturday and Sunday. ters were reflective, stu ious, and thought-provoking. those replies are now being carefully studied by our \kmmittee. 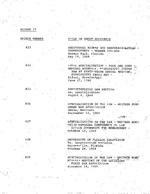 gat for action sometime in 1969.
no t this time have a specific plan whickd- .advocate. the public and the legal profession. imposed restrictions on their own practice. do find that specialization is not synonymous with expertness. shorter research time required, as well as from his experiences. tified specialist may or may not be an expert. promulgated to regulate specialization in the law practice. by those lawyers clearly entitled to accreditation as experts. to lawyers, will be minimized. certified legal specialist, are areas of great concern to me. position on this controversial subject. for use in all jurisdictions should be adopted. obviously indispensable ingredient of any acceptable plan. mittees studying the matter of specialization. system of certification of spe iali s would be obviated. specialization o balance seems best to me a \this time. re latory body is placed at the national level. and the results thereof evaluated. law in which they are so certified. enable them to be specialists in every field of the law. independent sole practitioner was insured. lawyers possessing unusual legal skills may be made known. of law that are extremely complex. in the public interest, and I believe it should be permitted. time, with resultant potential savings to their clients. in view of its particular circumstances and economy. wide plan to regulate voluntary specialization. ment in other fields of the law. ficient handling of legal work of his particular clients. down, which is right now. Address: "Specialization in the Law Whither now?" nor for the American Bar Association. law for the protection of the public and the bar; and approving. implement that resolution without success. tion of the Board of Governors and the House of Delegates. letters were reflective, studious, and thought-provoking. reached by a majority of the committee at our September meeting. for presentation to the House of Delegates sometime in 1969. As Chairman of the committee, I sincerely believe that the com-. ,members, at least on a tentative basis. public and the legal profession. find that specialization is not synonymous with expertness. research, unless his recent experiences contain the answer. of several years, and not by certification as a specialist. brings disfavor on the legal profession as a whole. those lawyers clearly entitled to accreditation as experts.